Although you probably won’t be editing your next great novel on your Droid X phone, you might want to fix the typos and ensure that the automatic word selection thing did its job properly. Happily, you can easily edit on the Droid X. The first task in editing text is to move the cursor — that blinking vertical line where text appears — to the right spot. To move the cursor, simply touch that part of the text where you want the cursor to blink. This method works, but because your finger is probably fatter than the spot where you want the cursor, it’s not quite effective. A target icon appears where the cursor is located. If a pop-up menu appears rather than the target option, press the Back soft button to dismiss the pop-up menu. Try Step 1 again to make the target icon appear. While that icon is visible, touch the screen again right on the icon and keep your finger down. A pop-up magnification bubble appears, which lets you better position the cursor. Start selecting text by pressing and holding — a long press — any part of a text screen or input box. The Edit Text menu appears. 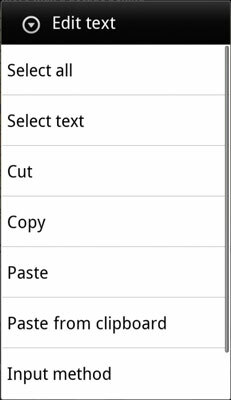 Choose Select All in the Edit Text menu to select all text, either in an input box or whatever text you’ve been entering or editing in the current application. Alternatively, choose Select Text to select a block of text starting at the cursor’s location. Use the pointers at the start and end of the text to select the starting and ending point of a block of text. Delete text by touching the Del key on the keyboard. Replace text by typing something new while the text is selected. To dismiss the Edit Text menu, press the Back soft button. Press the Menu soft button to summon the Web browser’s menu. Drag your finger over the text on the Web page you want to copy. Lift your finger to complete selecting the text. When you’re finished selecting, the text is instantly copied. You can then paste the text into any application on your phone that accepts text input. After selecting a chunk of text on the screen, you can then cut or copy that text and paste it elsewhere. Copying or cutting and then pasting text works just like it does on your computer. Select the text you want to cut or copy. Touch the text on the touchscreen and keep your finger down. The Edit Text menu appears. Touch Cut or Copy on the menu to cut or copy the text. When you choose Cut, the text is removed; the cut-and-paste operation moves text. If necessary, start the application you want to paste text into. 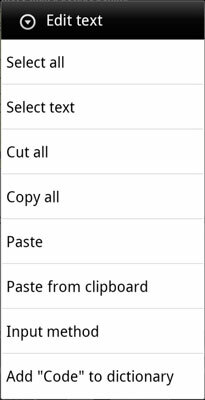 Touch the input box or text area where you want to paste the copied or cut text. Move the cursor to the exact spot where you want to paste the text. Long-press the text box or area. Touch the Paste command from the Edit Text menu that appears. The text you cut or copied appears where the cursor was blinking. The text you paste can be pasted again and again. Until you cut or copy additional text, you can use the Paste command to your heart’s content.